The first step in the home cooling process begins with none other than your air conditioner. Therefore, it makes sense to give the air conditioner a deep cleaning. This will prevent it from tainting the rest of the HVAC system as well as the home. Blower Fans: The fans that blow cooled air through your duct system can become caked with dust. Along with spreading unclean air, excessive buildup of dirt and dust can also add unnecessary weight to the blower and cause it to burn out sooner than anticipated. Coils: With the right combination of heat and moisture in the air, dirty evaporator and condenser coils can encourage the growth of bacteria and mold. This occurrence, known as “dirty sock syndrome,” can lead to foul odors and may spread mold spores. Air Filter: The HVAC filter comes with its own filter to screen out dust and dirt. If this filter is not changed regularly—despite the season—it can reduce airflow and make for stagnant air. After getting your AC cleaned up, the next link in the system is the ductwork. Air flows through the ducts and exits through the air registers in each room of the home. So if the ducts are too dirty, the flow of air can kick up dust and dirt and blow it into the home. After all, it’s estimated that nearly 40 pounds of dust can accumulate in the home on an annual basis. A portion of that will remain in your duct system and remain uncleaned. You can wipe any dirt from the air register itself, but to do a thorough duct cleaning—one that goes inside the ductwork and effectively cleans out all the dust—you’ll need the help of qualified professionals. With the AC and the ducts cleaned, you will have greatly reduced the potential for spreading germs and bacteria through your home. What you need now is a more proactive approach to fighting germs, and you can achieve that with an air purifier. Air purification systems actively scrub the air that cycles through your air circulation. They help eliminate dust, dirt, pet dander, and other contaminants. Even better for this season are UV air purifiers. By installing a UV light bulb in your HVAC system, the air purifier will eliminate microorganisms, bacteria, and viruses. Whether it’s a normal air purifier or the UV variation, these devices are also used in commercial settings where dozens of employees will benefit from their use. 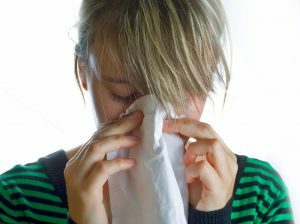 Bringing that same power into your home is highly effective for fighting back against seasonal illness. For more information on cleaning and purifying your air, contact Air On Demand today!